I may not condone sneaking vegetables into my kids' food, but I have occasionally found myself at peace with resorting to bribery when trying to get them to eat a food they profess to detest. 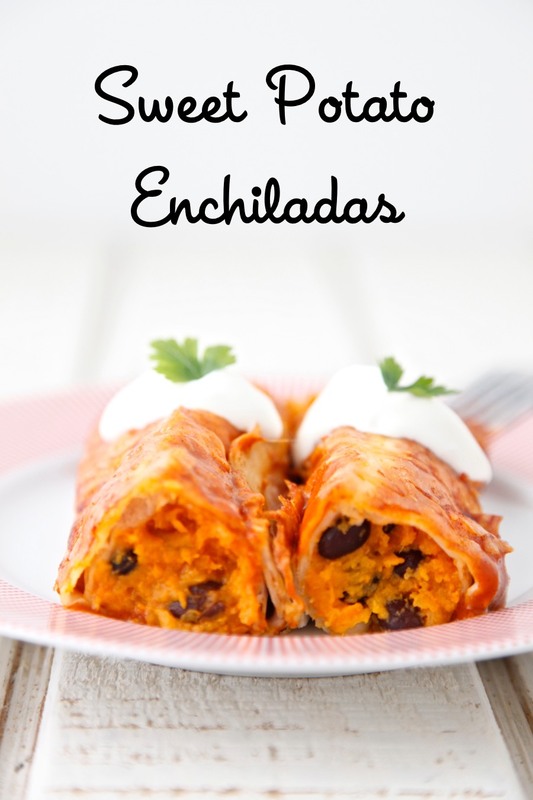 If this type of mealtime tactic is not your style you may want to skip reading the rest of the post and proceed directly to the bottom to get the recipe for these unbelievably easy and tasty vegetarian Sweet Potato Black Bean Enchiladas. However, if you can forgive my transgressions and are interested in hearing about one of my less admirable mealtime techniques, read on. I'll give you a second to decide. OK, here goes_ Kenya doesn't like beans anymore. This development isn't the easiest on me when it comes to cooking for my family since I love using beans and Chloe absolutely lives for them. In fact, she's been know to eat up to three bowls of Pressure Cooker Beans in one sitting. On the other hand, Kenya, you can't even mention beans to him, let alone offer him some. The first time I made these Sweet Potato Black Bean Enchiladas (which first previewed on Weelicious Menus several months ago) they were a hit in my house. Well, sort of. Kenya had come home famished from an after school activity and so at dinner he voraciously dove right into his enchiladas since he pretty much loves anything wrapped in a tortilla. Three bites in though he paused for a beat before shrieking, you know I hate beans! He had been so hungry he didn't notice the black beans until he had actually taken a second to look at what he was eating. After a bit of protesting, Kenya's hunger got the better of him and he resumed eating the enchilada, although he did so selectively, pushing the beans aside to form a little mountain at the edge of his plate. Watching this kinda bummed me out as I was excited about how my new vegetarian recipe turned out. However, he obviously still liked the enchiladas enough (minus the beans, of course) to polish off two of them, so I wasn't ready to give up on getting him to eat the beans, too. One of the major challenges with kids and food is when their aversion to a certain food is more psychological rather than on account of the taste. Kenya used to love beans when he was younger, but at some point something altered his opinion of them. Once Kenya makes his mind up about something it can be almost impossible to turn him around but I made it my mission to convince him they were worth eating. I'll report back on whether he eats these or not the next time I make them! 2. Poke the sweet potatoes all over with a fork and place on a foil lined baking sheet in the oven until fork tender, about 1 hour. Turn the oven down to 350F. 3. Remove from the oven, allow to cool slightly, then slice down the middle and scoop out all the pulp into a bowl. 4. To the sweet potato pulp, add the garlic powder, onion powder, cumin, salt, black beans, and 1 cup of cheese. Stir to thoroughly combine. 5. Pour half of the enchilada sauce into a 9x11 baking dish. 6. Place about 1/2 cup mixture into the middle of each tortilla and roll up. 7. Place the enchiladas, seam side down, into the baking dish. Pour the remaining enchilada sauce on top. 8. Cover with foil and bake for 15 minutes. Note: The sweet potatoes can be baked up to 2 days ahead of time and the pulp removed and stored in the fridge. Do you have a favorite brand for the enchilada sauce? Thanks! My son calls black beans throw up beans because that is what happens when he eats them so the rest of us eat them and enjoy them! Now that is an easy recipe!! Thanks! I have a ton of homemade sweet potato puree....would this work? These sound SO good! My kids have both gone through weird phases where they just decided they didn't like something anymore too. Lately my son dislikes beans of all kinds and bananas. I tell him that if he eats them he will be big and strong like Spiderman...it's funny that it works, almost every time! Do you drain the beans before adding? I love the story behind this dish!! My girls love black beans it's there dad who in front of the girls tells them how nasty they are but maybe I can get him to eat them this way! Thanks for the recipe! we don't get enchilada sauce here. is there something else i can use or make instead of it. This recipe is delish! If you like sweet and savory, then you will def be a fan of this recipe! I added corn and used the green enchilada sauce. Do you have a good recipe for homemade enchilada sauce? Just curious if I could avoid an extra trip to the store. 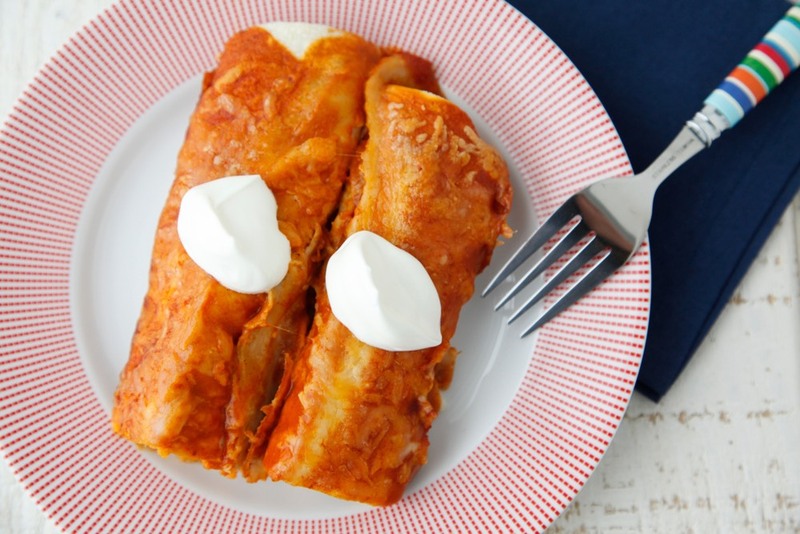 Love the idea of sweet potato enchiladas. Do you think this would freeze well? I'm curious about an enchilada sauce recipe too. Every time I buy it, I'm really not pleased with the tinny flavor. Would shredded chicken be good to add inside to make a complete meal? Can you suggest anything else to replace the onion and garlic powder? This dish satisfied a vegetarian parent, a meat and potatoes parent, a picky toddler and a sensory processing plagued preschooler. What a relief for the chef! Thank you for this delicious and nutritious recipe! These are so delicious. I found a recipe for enchilada sauce by Emeril on foodnetwork.com because I didn't have any at home. The whole dish with a dollop of plain yogurt on top was so nicely balanced. I highly recommend this dish! Thank you Catherine! my 3YO loves these! instead of garlic and onion powder, I drained the black beans and sautéed garlic and onion then added the beans. great recipe. thank you! Has anyone tried freezing these? I would love to make these ahead of time for my husband to make for the kids on nights I'm not home. I would also like to know if they can be prepared in advance and frozen! Any ideas for a good sauce that does not have tomatoes? My LO can't have them. I was thinking perhaps green enchilada sauce, but I wasn't sure that would be too tasty. Has anyone tried any other sauce? This is still in the oven but the filling is delicious! Thanks for your healthful recipes. I found this recipe on Pinterest, pinned it, and just made it tonight. It was awesome! The only thing I did different was, instead of the garlic and onion powders, I sautéed half an onion and a large clove of garlic (minced) before adding it to the filling. 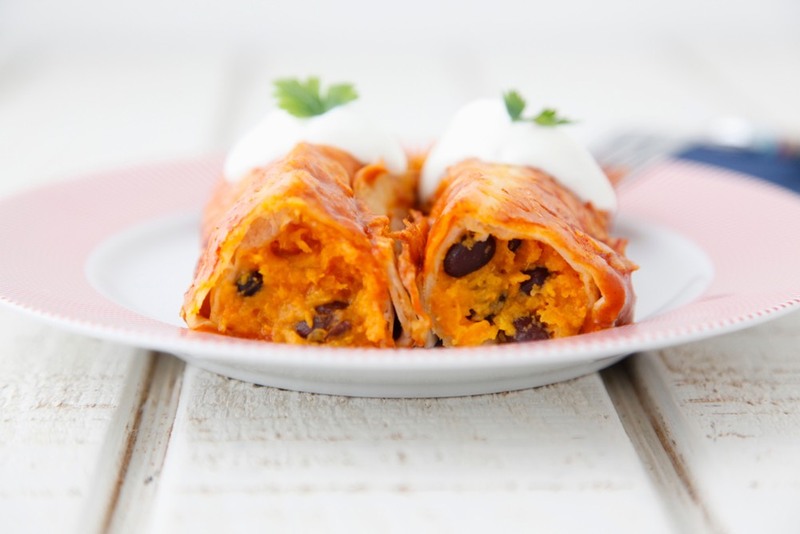 I have tried a different sweet potato/black bean enchilada recipe before, but this one is way better! This recipe is a keeper, thank you! This recipe is in our family's regular rotation...it's just so good. The only thing I change is I may add a cup of shredded chicken if I have it on hand. Other than that, it's just perfect. So glad this recipe was a hit! This is a favorite in our household. Thank you!